Sometime in 1998 0r '99, a group of lunatics plagued with the curse of certainty discovered the perfect presidential candidate. He was an amiable, likeable guy, but more importantly he was dumber than a box of rocks. He believed rightwing talking points with all his simple heart and had guaranteed name recognition. He wasn't the shoe-in they thought he was, though. After actually losing the popular vote, he became president anyway -- thanks to five Supreme Court Justices with no respect for democracy. Their candidate was eventually sworn in as the President of the United States and quickly proved the depth of his competence by losing a fair fight to a pretzel. By the time George W. Bush left office, America had suffered the worst terrorist attack in American history, was engaged in two wars, was having a debate over whether it was OK to torture people, and had a smoking ruin where the economy used to be. In a more rational world, the lunatics plagued with the curse of certainty -- or "neoconservatives," as they're more commonly known -- would be out of politics for good. Any hint of neocon influence on a candidate would be the first sign of the death of the campaign and children would point and laugh at them when they walked down the street. But this is not a more rational world. These guys show up all the time on talking head shows, where they're treated as oh-so-serious political minds, rather than the complete and utter failures that history shows they to be. And oftentimes the other talking heads are the boneheaded pundits who cheered on the neocon idiocy. Thanks to a media all too happy to allow people to fail upward -- or, at least, laterally -- neocon clowns can continue their neocon clown show, without fear that anyone will point out just how completely incompetent they've proven to be. Meanwhile, the media's neocon cheerleaders get to keep their pundit jobs, despite the fact that they've just spent the last twelve years at least getting nearly everything exactly wrong. And so the cycle rolls on. Bush's inner circle seeks to become some other candidate's inner circle, hoping no one will notice. They seek to rebuild the neocon machine, to begin anew the work of The Vulcans, to try again at that New American Century, and to find another patsy to take the fall in the history books should it all go haywire again. And they've found one. One Willard Mitt Romney. Over at ThinkProgress, they've been doing a great job of pulling back the curtain on the Romney campaign and exposing all the little Bushies behind it. Mitt Romney is the next George W. Bush and his campaign advisers show it. On the economy and foreign policy -- Bush's two greatest failures -- Team Romney is just recycled Team Bush. And his policies are just recycled Bush policies. 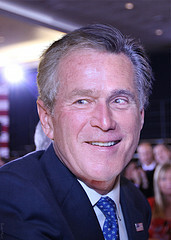 On economics, TP's Travis Waldron writes that Romney "seems to be chasing an agenda that truly is 'Bush updated.'" "Former Massachusetts Gov. Mitt Romney’s economic advisers include two former chairmen of Bush’s Council on Economic Advisers and a veteran of Bush’s 2004 re-election campaign," he writes. "The policies favored by those advisers include even bigger tax cuts, more deregulation, and support for dismantling Social Security." Because that all worked out so great the last time, I guess. And on foreign policy, we're told, "[W]hat’s troublesome about Romney on foreign policy is what’s cooking behind the scenes. Gen. Colin Powell recently complained that Romney’s foreign policy team is 'quite far to the right.' Indeed, veterans of the Bush/Cheney administration 'pepper' Romney’s foreign policy team and the so-called 'Cheney-ites' are reportedly winning the presumptive GOP presidential nominee’s ear." If you're wondering if these guys could possibly be as awful at foreign policy as I'm making it seem, consider Mitt's recent world tour -- you know, the one where he managed to piss off just about everyone. That should give you a measure of the quality of advice his neocon advisers are giving him. And worse, how willing he is to take that lousy advice. If you liked the Bush years, you'll love the Romney years. On the other hand, if you're not crazy... Well, Mittens isn't your guy.